Permits in the Township for 2017 are currently at 17, three of which were new homes. A majority of the permits issued were for garages and additions. As a friendly reminder, please remove any old or not operable vehicles before winter comes. 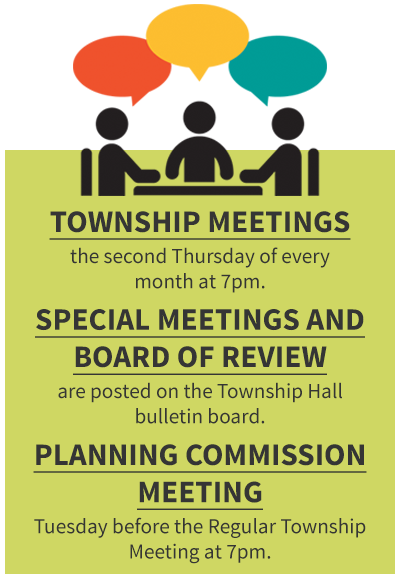 There is currently two proposed Zoning Ordinance changes on the agenda for the Township Board at the October 2017 meeting. The first reducing the minimum square footage for a residence or camp to 225 from 750. This proposed change accommodates persons wanting to build “Tiny Houses” or camps and cottages. You would still be required to follow all building codes and get an occupancy permit, but it could reduce the cost by allowing a smaller dwelling. The second proposed ordinance addresses the side setbacks in a platted subdivision.